David Moyes was a fantastic manager for Everton, there is no doubting that. Since he left though, he has made some interesting career choices that haven’t always worked out. Of course there was the initial move to Manchester United, where it seemed he was not ready for a club quite that size and he was sacked within 10 months of a ridiculous six-year contract, as the Red Devils floundered in seventh in the Premier League. A year later, he was sacked after a poor start to his second season in Spain, before taking the Sunderland job for the 2016/17 season. However, the Black Cats were relegated by the end of April and Moyes resigned in the summer. Perhaps the only saving grace for the now 55-year-old was his time at West Ham, where he took a squad of Slaven Bilic’s players from 18th in the league to a 13th place finish last season. Now though, the Scotsman is out of a job again and apparently has been filling his time by appearing on Sky Sports. In fact, last Sunday while offering his expertise at the Everton vs West Ham game he made one of the most outlandish claims in recent memory. 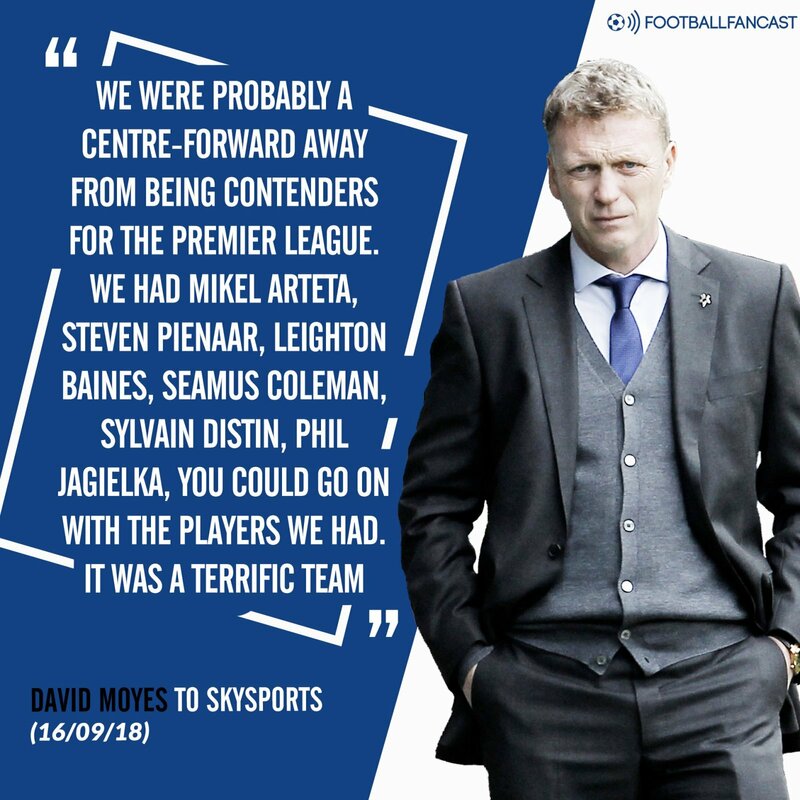 Moyes claimed that the side he had spent 11 and a half years building had a style of play that was as good as anybody in the league and that he was just a centre-forward away from challenging for the league title. During his first six years at Everton, the club yo-yoed between top and bottom half finishes, with their lowest points total being 39 as they finished 17th in 2003/04 and somehow avoided relegation. 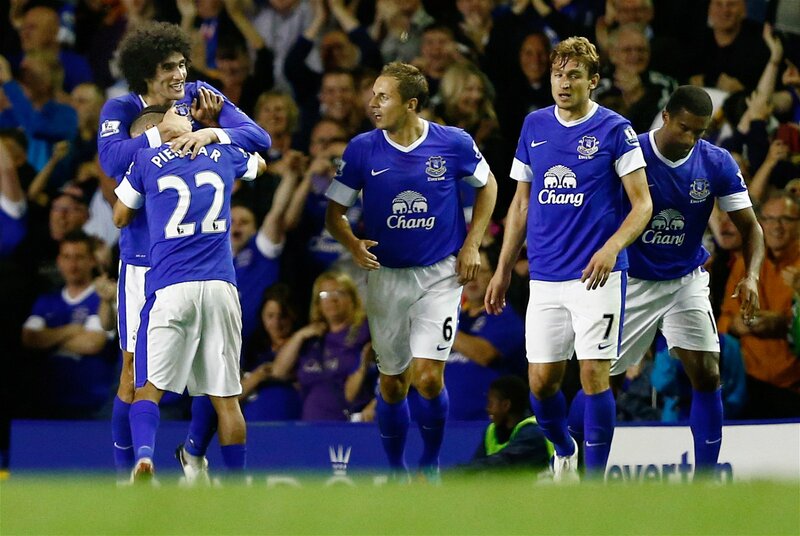 By the players that Moyes lists though, he must be talking about towards the end of his tenure at Goodison Park. Centre-back Sylvain Distin was the last of this crop to arrive, signing from Portsmouth in the summer of 2009. After that, Moyes’ Everton sides went on to finish eighth, then seventh twice and sixth in his final season before he left to replace Sir Alex Ferguson at Old Trafford. This is hardly the kind of form that many would associate with a team that are one player away from a title challenge and nobody has ever considered Everton as anywhere near the dominant and big spending side’s of Chelsea, Manchester City and Manchester United at the time. Leighton Baines and Seamus Coleman were fantastic full-backs and hit their prime at a very similar period, but Distin and Jagielka in between them were never going to win the Premier League and Steven Pienaar was light-years behind players such as David Silva or Chelsea’s Juan Mata in terms of quality and the ability to open up the top defences in the league. In fact, the style of play during Moyes’ later years at the club involved sticking Marouane Fellaini upfront and pumping the ball into the box – and very effective it was too but Everton fans will agree it certainly wasn’t pretty. The one thing he probably is correct about though is that the club lacked quality upfront, with Victor Anichebe, Louis Saha, Yakubu and Nikica Jelavic all among the notable strikers in those final few years. Right now, Toffees fans would probably bite your hand off for a couple of years of consistent seventh place finishes, and that’s more than okay. Moyes is deluded in his thoughts that his side were close to a Premier League title challenge, but he doesn’t need to be as they were genuinely good years for the Merseyside club, even though they were never going to challenge for the title.